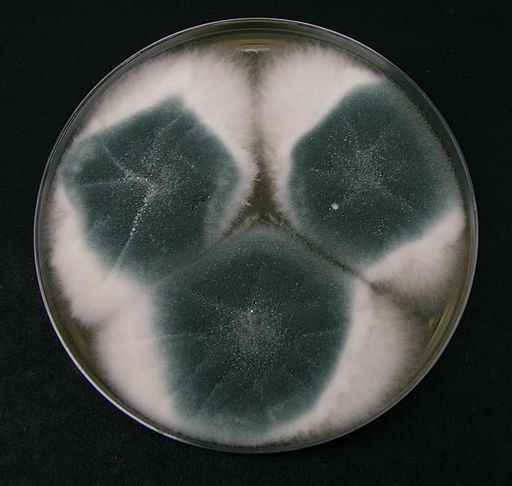 Aspergillus (Plural Aspergilli) is a genus of fungi that consists of about 300 identified species of mold (mould). Aspergillus can be found in a variety of environments throughout the world given that their growth is largely determined by the availability of water. The rate at which they grow is largely determined by the temperature range in the environment they grow in. Regardless, studies have shown Aspergillus to be able to tolerate extreme conditions only if all of the other conditions are ideal. Given that a majority reproduce asexually, they are often described as conidial fungi. However, studies are yet to determine how a good number of others reproduce while some have been shown to reproduce sexually. A majority have been shown to be terricolous, which means that they are largely found in soil/land. Since their discovery in the 1720s, they have become increasingly important in human health, agriculture as well as in biological sciences among others. * conidial fungi are fungi that reproduce asexually through the production of spores from the fungi hyphae. The spore produced is referred to as conidium. Aspergilli can be found throughout nature with their spores being abundant in air. In addition to largely being saprophytes that obtain their nutrition from dead and decaying matter, they can also be pathogenic to human beings and animals with some also affecting and damaging plants. Because they lack chlorophyll, and are therefore unable to produce their own food, they are dependent on other material in their surroundings for nutrition. Here, it is worth noting that Aspergilli are incapable of absorbing organic matter in their surroundings. For this reason, they release different types of enzymes such as amylase capable of breaking down these materials into simpler compounds that can be absorbed through the vegetative hyphae. The release of high amounts of these enzymes results in enhanced decay of all organic matter in their immediate environment and consequently the availability of more food source necessary for reproduction and growth. For most part, they reproduce asexually through the production of spores known as conidium (fungi spore). Once the spore lands on a favorable environment (with moisture, warmth and nutrients) they start germinating where they create numerous hyphae that form the mycelium. The hyphae allows them to grow, spread and continue reproducing across the surface of the substrate. * Aspergilli's hyphae develops into vegetative and reproductive hyphae. The vegetative hyphae serves to absorb nutrients while the reproductive hyphae develop further to produce spores. Aspergillus niger largely exist as saprophytes, which means that they obtain their nutrition from a variety of dead and decaying material such as leaves, fruits and other vegetation. As such, they also contribute to the delay of various food products. given that their source of vegetation are readily available virtually everywhere. A. niger are widely distributed and common in many geographical areas. However, they are known to be particularly prevalent in areas with higher temperatures. * Research has show that the black spores of A. niger help protect them from the sun's radiation, which in turn allows this species to thrive in warm areas. Like others, Aspergillus niger are filamentous fungi, which means that they tend to form filaments (hyphae) and thus resemble the structure of a plant. When viewed under the microscope, A. niger consists of a smooth and colorless conidiophores and spores. A closer look will reveal the conidial heads of the organism to be globose and dark brown in color that have been shown to divide into a number of columns as the A. niger continues to age. Compared to the other types, A. niger produces dark or dark brown spores from their conidial heads (biserite). This is a characteristic that has only been seen on A. niger and none of the others. * In microscopy, the carbon black/dark brown color of the spores (as well as the conidia) is used to distinguish A. niger from other species in the same genus. Aspergillus niger is an ascomycetous fungus. This means that it is classified under the phylum Ascomycota, also commonly referred to as Sac Fungi. As such, spores are produced within the sacs (Asci) (asexually). 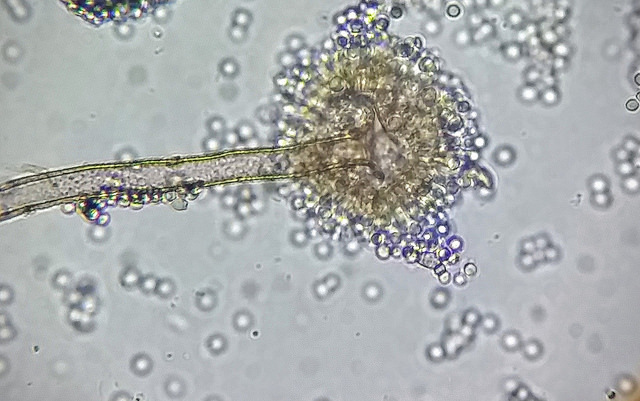 Like Aspergillus nidulans, colonies of A. niger that have been exposed to air (in suitable conditions for growth) tend to form vegetative and reproductive hyphae. 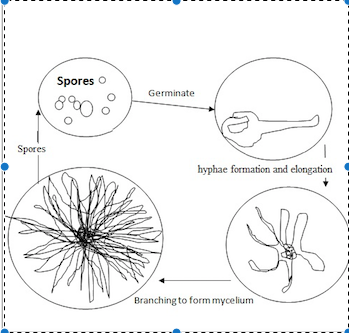 Whereas the vegetative hyphae absorb nutrients from the dead and decaying matter, the spores (conidium) are produced from the tip of the reproductive hyphae (that looks like a vesicle). Like A. niger, Aspergillus flavus are saprophytes that can be found in soil samples where they obtain their nutrition from dead and decaying matter. In particular, A. flavus are a nuisance to farmers given that they tend to infect and contaminate crops (seeds). S Strain - The S strain of Aspergillus flavus, also referred to as Group I strain has a sclerotia (hardened mass of mycelium) that is less than 400 mm in size, which is its defining characteristic. This strain has been shown to produce a consistently high content of aflatoxin that affects crops and animals alike. L Strain - Compared to the S strains, the L strain of Aspergillus flavus has a sclerotia that is larger than 400 mm in diameter. While this strain also produces aflatoxins, the amount produced vary from high to low and thus not consistent as is the case with the S strain. * In human beings, aflatoxins produced by Aspergillus tend to cause serious intestinal problems as well as liver cancers. Like other types, the A. flavus also produces hyphae, this includes the vegetative and reproductive hyphae. In the vegetative hyphae (mycelium) A. flavus produces enzymes that are responsible for the breakdown of food material into simpler forms that can be absorbed. While the organism has been shown to produce spores (conidiospores) asexually, studies have shown the genetic diversity of this species to be as a result of sexual reproduction where ascospores are produced within the sclerotia of A. flavus. When viewed under the microscope, A. flavus appear to have radiating conidial heads while the conidiophores will appear rough. Aspergillus fumigatus is one of the most prevalent Aspergillus found in most environments. 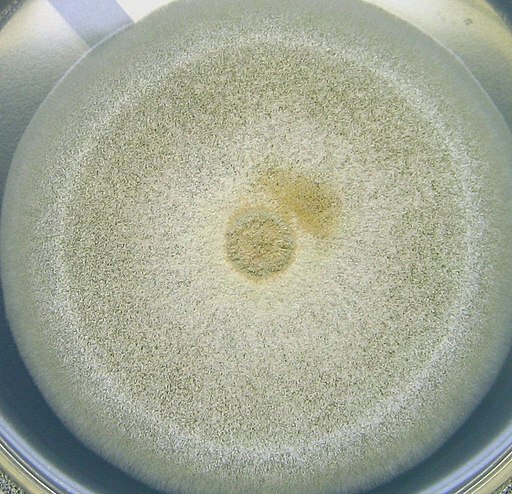 One of the most unique characteristics that separates A. fumigatus from the rest of the Aspergillus is that it can survive very high temperatures (it is thermotolerant) which is one of the reasons as to why it is more prevalent. A. fumigatus also exists as a saprophyte that plays an important role in the cycle of carbon and nitrogen in nature. Because it is very prevalent, the spores of A. fumigatus are also in high concentration in air, which presents a serious health issues for those with poor immunity. Compared to other species in this genus, A. fumigatus has been shown to be the leading infectious pathogen among those with compromised immunity. Aspergillus fumigatus is a filamentous fungi that uses both sexual and asexual means of reproduction. However, the sexual means of reproduction are yet to be understood. 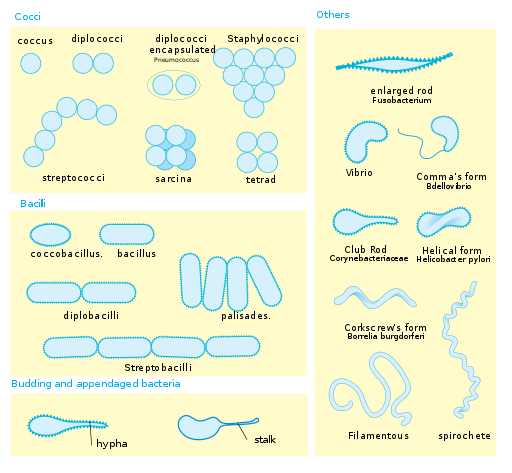 In asexual reproduction, conidia are produced through mitotic division. Here, mitotic division take place within the conidophore vesicle and are released by any disturbance of the immediate environment. This causes the spores to be in high concentration in air where they can be easily inhaled (causing health problems for those with compromised immunity) - asexual reproduction in Aspergillus fumigatus takes place when the mycelia does not interact with other haploid mycelia. When the mycelia comes in contact with the hyploid mycelia, then sexual reproduction occurs. According to studies, this means of reproduction in A. fumigatus often occurs when there is a low supply of nutrients particularly when the growing season comes to the end. This is therefore a beneficial means of production in that it allows the A. fumigatus to continue reproducing in unfavorable conditions. Here, the haploid hyphae come in contact allowing their nuclei to fuse. This is then followed by meiotic division of the diploid ascus to form ascospores (four of them) that are then released in air to continue the cycle. 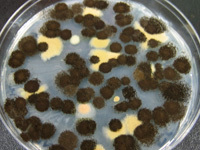 Aspergillus nidulans (Emericella nidulans) is also one of the most studied Aspergillus. One of the main reasons as to why it has become one of the most studied fungi is because it has been found to be very closely related to a majority of other species of Aspergillus in addition to a well organized genetic system. As such, it has proved to be particularly important in medical and industrial research. 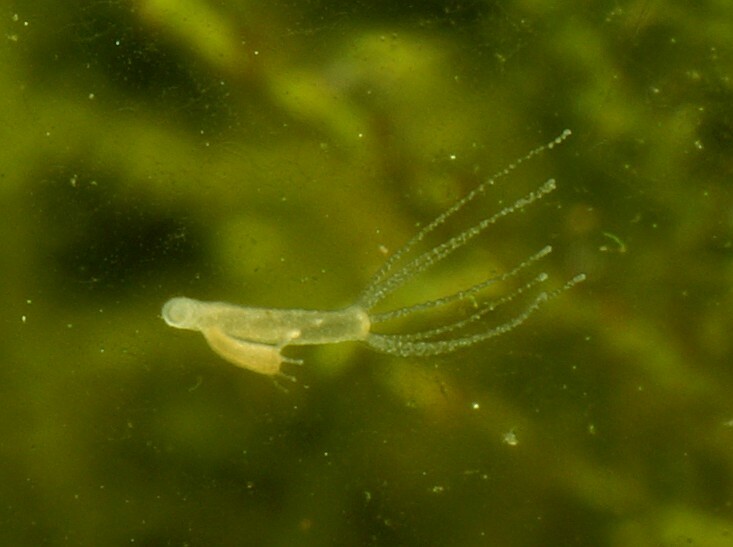 While it is the subject of many research studies, the means of reproduction of A. nidulans is yet to be well understood. However, a number of studies have shown the organism to use both the sexual and asexual means. Unlike the others that cause food spoilage by enhancing decay, Emericella nidulans does not necessary cause such spoilage. It can grow at relatively high temperatures and has been shown to produce a toxin (mycotoxin) that can result in health complications among those with compromised immunity. Carbon and nitrogen cycle - In response to its need for nutrition, studies have shown A. fumigatus to be able to sense the presence of nitrogen and carbon material resulting in the Aspergillus breaking down this material (particularly non-woody plants) to obtain nutrients and for absorption. This has been shown to be an important process in the cycle of carbon and nitrogen in nature. Enzymes - Aspergillus obtain their nutrients by releasing enzymes that break down food material into smaller constituents that can be easily absorbed. This mechanism has proved particularly beneficial in various industries where these organisms are being used for their enzymes to break down various proteins and other compounds. One of the most commonly used organism is A. oryzae, which is largely used for fermentation of various products. Food spoilage - Aflatoxins produced by some spoil various crop seeds. These toxins are dangerous and can cause serious health issues and even death when consumed. On the other hand, enzymes produced by Aspergillus enhance the decay of fruits and other foods. Human and animal infections - Aflatoxins, Aspergillus and their spores can have negative health consequences when inhaled. Whereas aflatoxins can affect both healthy and unhealthy animals and humans, Aspergillus and their spores can have grave negative consequences on the health of those with poor immunity. Fengfeng Wang. 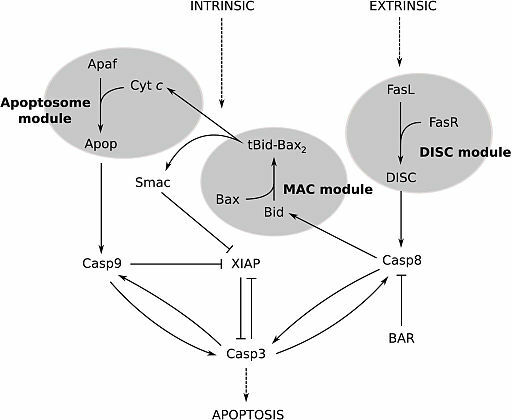 Inhibition of secretion by asexual reproduction in Aspergillus niger. 2014. Nancy Keller. Aspergillus flavus. September 2011. Tobias M Hohl. Aspergillus fumigatus: Principles of Pathogenesis and Host Defense. Article in Eukaryotic Cell · December 2007.